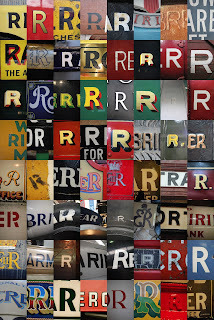 "R is for" was a project I started some time ago - of course, R is for Rhett, my son. There's a folder somewhere on Flickr with a few of these, but I've been snapping them for ages and have finally gotten around to corralling them all into one folder. Here are 64 I quite like. There are more, but 64 makes for a nice poster which I might have printed for his wall. It follows exactly the same idea as my numbers project. Whenever I see a nice letter R, I snap it. There are no hard and fast rules other than it must be upper case, and should be somewhere near the middle of a portrait shot. They're often out of arms reach, hence some are heavily distorted, but I quite like that. They come from a whole gamut of sources - steam trains, fairground rides, military vehicles, stations and even a couple of racing cars. Oh, and Concorde (third row up from the bottom, second from the left).